Signed "Jay Connaway" l.l., artist's label on the reverse. Oil on board, 15 x 23 3/4 in. (38.1 x 60.6 cm), framed. N.B. 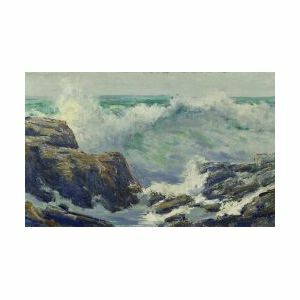 Connaway notes on his label that "(t)his painting is one of a series of marines (he) painted off the Maine coast at Head Harbor Island about six miles from the mainland. 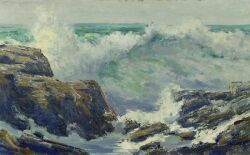 It was painted shortly after a storm, May 1924." Irving Amen (American, b. 1918) Still Life.